Surprisingly, the bedroom is often an overlooked room when it comes to making your house a beautiful, striking place because generally, no one else sees it except you! On the contrary, it should be the exact opposite as bedroom is like the heart of your house where you recharge yourself, where you finally feel like home after kicking off your shoes and retiring to bed. 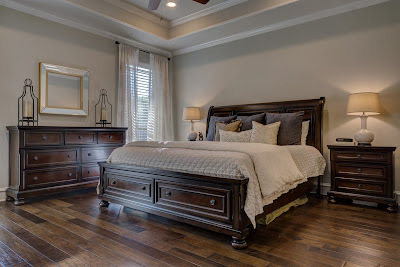 As explained on wifeknows.com, the most common reason for a bedroom to look cluttered and all chaotic is its furniture's disordered size and placement. Take a step back and have a good look at your room! No matter if you like a king size bed or have seen appealing two chairs with a table on the corner of a room in a magazine; go with what suits best in your room according to its size, whether it’s a queen size bed or double bed or just a cute vase on a small corner stand. The tip is to hold yourself back from overcrowding your bedroom with furniture and accessories. Give a spacious feeling to your room by creating more space and you will be amazed at the difference it makes. Overall, your bedroom has 5 walls and the fifth one is obviously the ceiling. First thing you see while you lie on your bed is that bland and blank surface, right? Try to change it! The easiest thing to do to it is the addition of a soft color; a little lighter version of the wall color or give a subtle pattern or stencil on the ceiling. If your room is spacious, then you can also opt for some architectural stuff in the form of moldings, beams or a chandelier. For enhancing luxury, add a canopy, all the way from the ceiling to your bed, giving a relaxing aura to your overall bedroom look. The easiest way to enhance colors, pattern and softness in a bedroom is to cover the windows beautifully with the draperies. It will not only help to frame the windows but will also give a complete look to your room. Add sheer curtains along with opaque roller blinds to pull down so that your privacy could be maintained along with a pretty presentation of your bedroom. The best thing you could do to your bedroom is to layer the lighting throughout. This would make your bedroom look more vibrant and spacious. You can use different sort of lights like the ambient one, which would give light to the whole room, accent one which would give the soft illumination to the walls and finally the small lamps which would give a focused light for all your workings. Nothing is more distasteful than to have a cluttered, messy bedroom. Here, a tip is to make room for everything which is possibly in use within your bedroom so that the room does not get disorganized. Keep the laundry bag, toy box, hangers, and extension cords all in place to avoid untidiness in the room. Remember, a chaotic room can never look luxurious so work on it as much as you can!